Obtaining Florida Homeowners Insurance Quotes Online is easy with Click & Save Insurance. Find the most affordable Florida Homeowners Insurance available based on your personal homeowner profile. Our team of insurance professionals are here to assist you. Call us today at 1-813-643-7770 for all of your Florida Insurance Services, or click here. According to the Insurance Information Institute, about 1 in 15 insured homes files a claim each year. Your home is one of your most important investments. Protect it with a Florida homeowners insurance policy. Homeowners insurance can help protect the physical structure of your home, your personal belongings and even your family. The specific details of your coverage will depend on which Florida policy you choose. Does Florida Homeowners Insurance cover flood damage? Most Florida home insurance policies don’t include protection from flood damage. If you’re interested in protecting your home and family from floods, you will need to invest in a separate flood insurance policy. One of our Click & Save Insurance agents can help you understand how flood insurance can help protect you and your family. How can I save money on my Florida Homeowners insurance? How can a Click & Save Homeowners Insurance Agent help me? Explain the various Florida Home Insurance policies and options. Give valuable information about the Florida Home Insurance claims process. 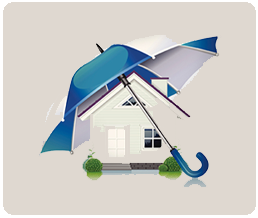 Explain what your Florida Homeowners Insurance coverage protects. Provide you with very important information on home safety. Do I need Homeowners Insurance for a Trampoline? Trampolines at home can be extremely fun, however they can also be dangerous and full of safety issues. They are simply very risky to insure. Make sure your insurance covers a trampoline before making the investment. With some insurance companies, your rate will skyrocket with a trampoline. Check with Click and Save Insurance first!